Eataly Elevates Food Retail, Tastes Success. What's Next? The tourists stream in one after the other, converging from all directions. You can tell they’re tourists not only by the cameras and the clothes—sweat-soaked T-shirts, faded polo shirts and drab sundresses no fashionable New Yorker would dream of wearing—but also by the goggle-eyed amazement on their faces as they drink the place in. It’s almost as if they’ve stepped out of the Flatiron District and into another country. Almost, but not quite. This is Eataly, the upscale food retailer and eatery that’s extending the tenets and traditions of Italian cuisine to all corners of the globe. The 50,000-square-foot New York store transports the dizzying sensory delights of an old-world Italian marketplace to the largest central business district in the U.S., with a multitude of gourmet meats, cheeses, pastas, breads, produce and desserts, all artfully arranged and presented for maximum mouthwatering appeal. Many products originate from the source in Italy, others come from suppliers and vendor partners in the U.S., some are made fresh daily in-house—and all capture the essence of la dolce vita. Eataly NYC also touts seven sit-down restaurants, each installed next to the specialty market that supplies its fresh ingredients. Seafood spot Il Pesce stands adjacent to the fishmonger, while rooftop restaurant and brewery Birreria serves a rotating menu of cask ales brewed just 30 feet away. The store houses a cooking school, spearheaded by celebrity chef (and Eataly business partner) Lidia Bastianich, as well as a complementary selection of housewares and utensils. It’s a veritable theme park for foodies—Epcot for epicures, if you will—and since opening in 2010, it has emerged as one of New York’s busiest shopping destinations and tourist attractions, welcoming 8,000 to 10,000 guests each weekday and 12,000 to 13,000 per day on weekends. 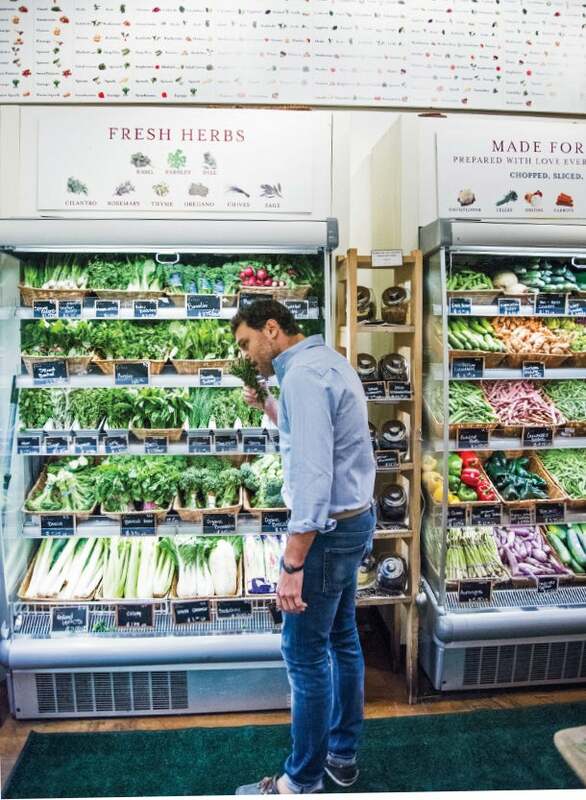 Getting fresh: Nicola Farinetti in Eataly NYC's produce section. Eataly operates 27 locations worldwide, including 10 in its native Italy, 13 in Japan and one in downtown Chicago. A second New York site inside the rebuilt World Trade Center is under development. Eataly regularly scouts real estate in major metropolitan cities across the U.S. and overseas in search of additional expansion opportunities. Oscar Farinetti opened the first Eataly location in 2007 on the site of a shuttered vermouth factory in Turin, Italy. For Farinetti, it was a return to his roots: The product of a long line of artisanal pasta-makers, he went to work at his family’s electronics shop in 1978; over time he transformed the business into Italy’s largest consumer electronics chain, Unieuro, which he sold in 2003 for 528 million euros. Farinetti envisioned a store celebrating Italy’s rich dining culture, encompassing retail and restaurants, as well as an educational component designed to give consumers deeper insight into the food they eat and the people responsible for bringing it to market. The original Turin location created the blueprint that other Eataly stores still follow, spotlighting artisanal products sourced from hundreds of native Italian vendors and supplemented by informational cards detailing each item’s origin and suggested use. Experts in their respective fields oversee each dedicated area of the store, and all employees are trained to authoritatively address shoppers’ questions. 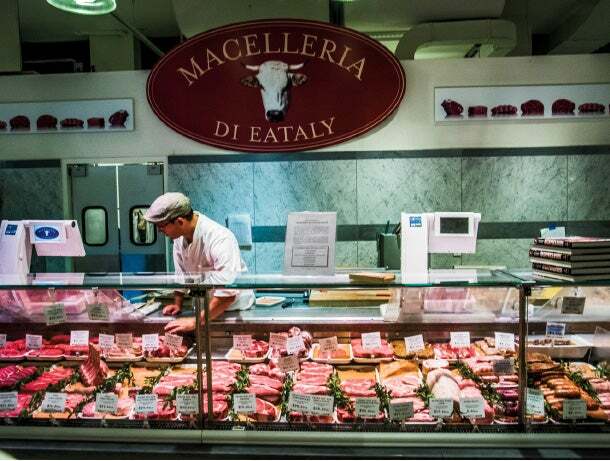 Don't have a cow: Eataly NYC's meat counter, famous for the razza Piemontese cut. Eataly follows the principles of Slow Food, a movement founded in 1989 by Farinetti’s longtime friend Carlo Petrini, an Italian journalist and activist. Outraged by the prospect of a McDonald’s opening near the historic Spanish Steps in Rome’s Piazza di Spagna, Petrini outlined his Slow Food Manifesto, condemning the mounting industrialization of food while promoting artisanal vendors, sustainable agriculture and consumer education. The Slow Food network now counts 150,000 active members across more than 150 countries, including more than 170 in the U.S. alone. Eataly’s success at home enabled Farinetti to extend the brand to Tokyo in 2008, setting up shop in a large department store in Daikanyama. While adhering to the company’s fundamental emphasis on native Italian cuisine—the store has imported thousands of dry pastas, olive oils and other staples, most available outside of Italy for the first time ever—Eataly Japan also offers delicacies and ingredients from regional partners, even updating its restaurant menus with local influences (for instance, shredding my?ga ginger atop an insalata verde). Eataly leveraged the lessons it learned in Japan to ease its entry into its next international market, New York. Farinetti and his team spent close to two years seeking the ideal location, finally identifying the ground floor of the 16-story Toy Building, a former toy-manufacturing hub near the intersection of Fifth Avenue and Broadway, across from Madison Square Park. Farinetti installed his son Nicola to lead the Manhattan project in 2010. Those partners include the Saper brothers, New York natives who fell in love with Italian food and culture as children. While working for his father’s medical technology firm, Adam Saper traveled to Italy and befriended Luca Baffigo—now co-CEO of Eataly—who introduced him to Oscar Farinetti. Saper remained in contact with Farinetti when he returned stateside, and in time they began discussing a role in Eataly NYC. Adam also recruited his brother, Alex, previously a real-estate investment banker at J.P. Morgan. Eataly USA also boasts some serious star wattage, in the form of partners Bastianich (host of PBS cooking programs like Lidia’s Italian-American Kitchen and chef/owner of the influential New York restaurant Felidia), her son, Joe (a restaurateur and judge on the Fox reality show MasterChef), and Mario Batali (the chef, writer, restaurateur and media personality famed for his series of Food Network productions and co-hosting ABC daytime’s The Chew). Together they comprise the Batali & Bastianich Hospitality Group (B&BHG), which owns and operates acclaimed eateries including New York’s Babbo Ristorante e Enoteca, Los Angeles’ Osteria Mozza and Las Vegas’ Carnevino Italian Steakhouse. While the B&BHG triumvirate does not oversee Eataly on a day-to-day basis, Adam Saper and other executives speak to them several times a week. 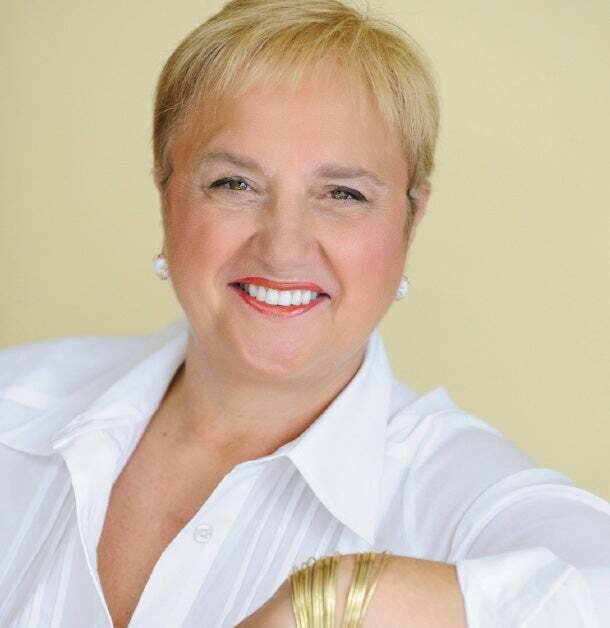 Batali’s influence ripples most strongly across Eataly USA’s restaurant operations; Lidia Bastianich shapes the company’s cooking classes and other educational efforts, such as in-store demonstrations and tastings; and Joe Bastianich lends his expertise to wine sales. It wasn’t so long ago that an upmarket food retailer like Eataly would have been unthinkable on American shores, let alone one dedicated expressly to Italian cuisine. In his bestselling 2006 book, The United States of Arugula, which documents the history of the American foodie revolution, David Kamp states that as recently as 1939—the year the New York Herald Tribune first alerted its readers to the arrival of a dish called “pizza,” complete with pronunciation guide—most citizens dined out only on special occasions and limited their diet to foods within their particular regional and cultural milieu. The nation’s elite class held Italian food in particular contempt. “Italian food in pre-1950 America was at best ghettoized as a sort of ethnic food you’d eat only when you went to an Italian neighborhood,” Kamp says from his New York City office. “It was maligned as déclassé and vulgar—to certain palates, it was too garlicky or too flavor-forward.” He adds that the stereotypes did not truly start to disappear until the 1970s, when trailblazers like food writer Marcella Hazan and retailer Giorgio DeLuca—and later Bastianich and chef Pino Luongo—redefined Italian food’s cultural identity. 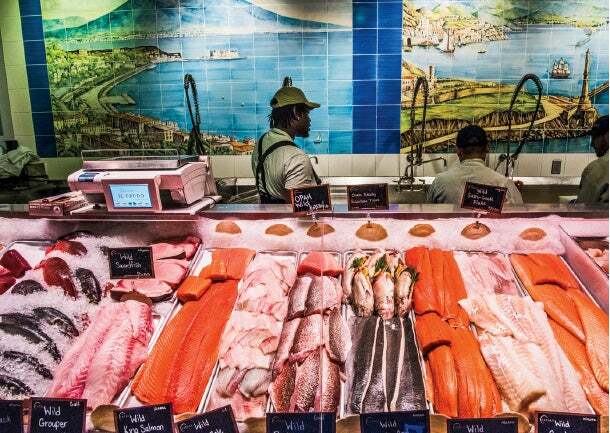 Reeling 'em in: Eataly NYC's fish counter. of foodie fetishism coincided with a period of American prosperity, but after the housing bubble burst and the U.S. economy hit the skids, many financial analysts expected the sector to flounder as discretionary spending dwindled. It didn’t happen. 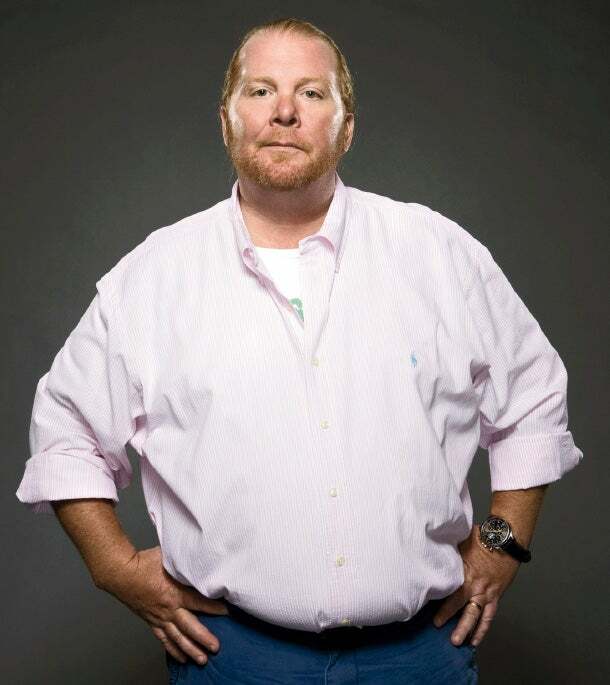 Star power: Eataly partner Mario Batali. The sheer volume of foot traffic parading through Eataly NYC each day supports Kamp’s argument. To that same point, Eataly disputes the notion that its food is overpriced in comparison to mass-market supermarket chains. Eataly’s obsession with quality explains its magnetic pull on tourists as well as its popularity among Flatiron District professionals and other neighborhood denizens coming in to grab lunch, groceries or some combination of the two. While the customer mix fluctuates depending on seasonal factors, Eataly NYC on an average day welcomes a 50-50 split between locals and out-of-towners, with more than 25,000 people dining in its restaurants every week. That’s not a bad problem to have: According to Adam Saper, Eataly NYC’s annual revenue is more than double the store’s best estimates when it launched in 2010. (Eataly does not disclose actual revenue numbers.) But it is a problem, and Saper admits that customer complaints about overcrowding and inefficiency are driving forces behind the company’s decision to open a second New York store. The new location, scheduled to open in the autumn of 2015, will occupy the base of 4 World Trade Center, the eco-friendly office tower designed by Pritzker-prize- winning architect Fumihiko Maki. The floor-to-ceiling glass structure, which promises direct access to virtually all New York subway lines, is also reportedly slated to host chic retailers including Apple, Hugo Boss, John Varvatos and Breitling. The company continues to build on the momentum generated by the Chicago location, which opened in late 2013. Eataly reportedly spent $20 million to build out the two-story, 63,000-square-foot Chicago space, which occupies the site of the former ESPN Zone in the River North shopping district. The store features 23 eateries optimized for the death-defying Chicago palate; one spot, Il Fritto, offers nothing but deep-fried dishes. Beyond the U.S., Eataly will be opening in Moscow and São Paulo in 2015 (adding to its roster of stores in far-flung destinations like Istanbul and Dubai). While finding the right local products and partners in each city can pose challenges, Eataly is confident its model can flourish in virtually any major market. Food, after all, is an international language.